Eastern Conference-leading Montreal Impact rallied from a three-goal deficit to force a draw against Columbus Crew on Saturday. Dominic Oduro scored in the 93rd minute to cap the comeback at Columbus Crew Stadium as Montreal staged a brilliant second-half fightback in the contest. Kei Kamara and Higuain each scored twice for Columbus who seized control in the second half only to relinquish their lead moments later. Ivorian centre forward, Drogba converted a penalty for Montreal in the 57th minute and Ignacio Piatti scored his second goal of the game one minute later to pull it back to 4-3. Things came apart at the end for the Crew, last year’s MLS runner-up, in a match where both defences left much to be desired. Impact defender Laurent Ciman prised the efforts of his team mater in the post match interview. “Attacking players did their job today, and we have to tip our hat to them,” he said. “Defensively, we have to show our fans that tonight was a mistake. We can’t be satisfied,” he added in the game that was attended by over 14,000 fans. 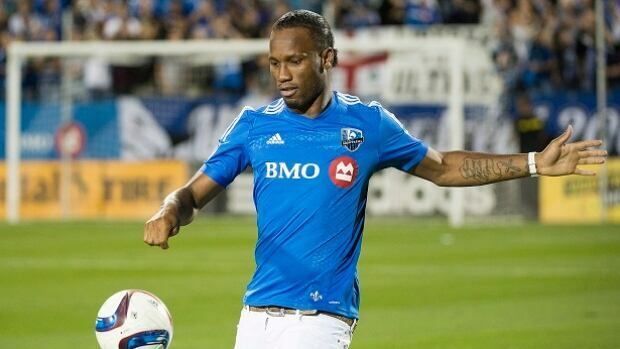 The goal makes the third of Drogba’s since his return from injury and the second straight one in the MLS.